The term Silk Road was first used by the German geographer, Ferdinand von Richthofen, in 1877. The name refers to the land and sea trading networks of the ancient and middle ages that have connected East, South and West Asia with Europe and North Africa. 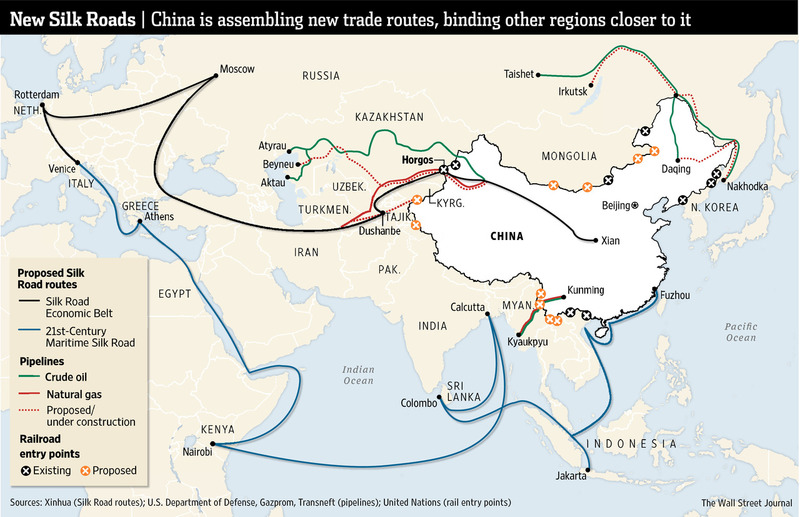 In 2013 Xi Jinping, President of the People’s Republic of China, announced the New Silk Road Program, later called “One Belt One Way” strategy (Yi Dai Yi Lu – One Belt, One Road – OBOR), to establish new connections between China and the Eurasian continent. The following maps are intended to depict what the Silk Road meant in history and what it means today. President Xi Jinping announced in May 2013 the 21st Century New Silk Road Program, later called “One Belt One Road” strategy (Yi Dai Yi Lu – One Belt, One Road – OBOR) with a view to establish new relations between China and the Eurasian continent. Its purpose is to establish a land connection via Central and Western Asia, between China and Europe, and sea links through South East Asia to Africa and Europe. By doing so, China aims to strengthen its influence on world economy and politics, and deepen regional cooperation. The total population of the countries covered by the strategy is approximately 4.4 billion people, accounting for 63 percent of the world’s total population and one third of the global economy’s performance. The Silk Road name (in German Seidenstraße) comes from Ferdinand von Richthofen. The German geographer and cartographer depicted the most important land routes and stations on the map above. The Northern Path ran northwestward through China’s Gansu province then continuing in three different routes. Two of them followed the mountains to the north and south of the Takla-Makan desert, then reunited with Kashgar. The third lead to the north of the Tianshan Mountains, via Turfan, Talgar and Almaty, which is the southeastern part of Kazakhstan today. The above map illustrates what a complex network of roads the name actually covered. In addition to the land routes, trade was also conducted on sea. Major mainland and maritime routes have been joined by several side tracks, forming a real world trading network. The New Silk Road – just like the ancient one also does not have one single route, but aims at building several regional trade and economic links. Not only roads, railways and ports, ie transport infrastructure, but also energy routes (oil and gas pipelines) play an important role (as shown in the above map). Raiways play an important role in freight transport, on the above map they are depicted with the most important trading ports. Track gauges are also shown as they are particularly important in determining the speed of freight transport. The existing and planned high-speed rail networks are also depicted. It is an important question of how much trade each different region is conducting with China, and how much influence they have on the world markets. Taking it into consideration is indispensable for analyzing the importance of the New Silk Road. The establishment of AIIB (Asian Infrastructure Investment Bank) was announced in 2013 and started its operations in 2015. Its objective is, inter alia, to facilitate the financing of infrastructure investments related to the New Silk Road. The fact that China’s intentions with the Silk Road are on a global scale is well illustrated by the above map, which unlike the previous ones shows the many ports in West Africa which are of Chinese interest, as well as the intra-African railways, which are ultimately linked to the stations of the Sea Silk Road. Like the Classic Silk Road, the New Silk Road is also a network of intricate routes, which are commonly classified as different economic corridors. This is depicted on the map above with the most important primary and secondary nodes. Literature currently distinguishes six commercial corridors in relation to the Land Silk Road, which is illustrated by the map above. An interactive map produced by Foreign Policy presents the economic and political affiliation of different countries to the New Silk Route (details on the website) through each station. DHL’s interactive graphic illustrates the logistical interfaces of the existing land infrastructure, showing how much time it takes for each commodity to take the full route. Interesting to know some new informations about the Silk Road in details. I am professor Dr Bashir Ahmad, want to use your OBOR map in a chapter of my with your reference as http://www.silkroutes.net/OBOR/9MapWallStreetJounal.jpg. Please accord permission to use it, thanks.